People of all ages can dance exercise together if you have a method that allows for all fitness levels to participate. 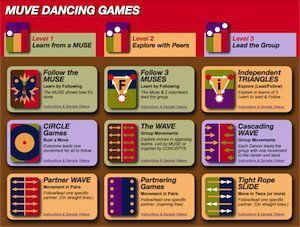 MUVE is a dance method that helps people realize that moving to music is easy, fun and also effective in improving physical and mental wellness. Most of all it feels great to do. The challenge is to get up and try it. The advent of television and computers had the effect of decreasing physical activity for most people. Obesity amongst children and adults is one of the results of sedentary lifestyle. MUVE wants to offer little activity breaks, giving the body relief from inactivity. Dancing to music also helps with relaxation and stress relief for the mind. Forget your worries for 3 minutes of dancing fun for seniors, adults, parents and kids. This video was taped at a performance for The Great Aloha Run Expo in Honolulu Hawaii. This is the only surviving dance from the very first trial video shoot in December 2007. I did not know how to position the 2nd camera. Only the wide shot camera footage survived the edit. Susan, Maria and I had a blast with this energetic song, and it shows. Diabolo Rojo is a very fast tune by Rodrigo and Gabriella, perfect for dance aerobic exercise. (Kuu-Hoa) In Hawaii Families can dance exercise in front of their TV every week-night on OC Channel 16! As part of the Tiny TV show MUVE airs a one-song dance along to inspire people to get active and take a break from sedentary TV watching. Young and old can dance together. No need to learn choreography, just dance along loosely! MUVEing feels good while it helps loosen and invigorate bodies and minds. First "1-Minute MUVE," • 1/1/10 Office MUVE 1 Shortest MUVE-dance along video ever. Now this you can do! Go ahead and give it a try!